Transfer Rate: 667Mhz. Error Correction: Fully Buffered ECC. Capacity: 32GB (8x 4GB). HP ProLiant BL20P G4 Server Blades Dell Precision WorkStation R5400 IBM System x3450. HP ProLiant BL460c Server Blades Dell Precision WorkStation 490 IBM System x3500. Removed from a fully working server. WHAT'S INCLUDED: - 8 x 16GB RAM Sticks ONLY. WHAT'SNOT INCLUDED: - Other accessories / Cables / Software / Installation advice etc. TESTING: - Working order. UK, longer for all other areas! However we may use our discretion also to provide the safest and best service. Serial numbers : All relevant serial numbers are logged in a data base, we also use warranty stickers where appropriate. WHAT'S INCLUDED: - 8 x 16GB RAM Sticks ONLY. - Removed from a fully working server. WHAT'SNOT INCLUDED: - Other accessories / Cables / Software / Installation advice etc. TESTING: - Working order. Condition is Used. Removed from a working server. HP Proliant ML10 v2 G8. HP ProLiant ML10 v2 G8. HP Quick Specs. These sticks are tested and in excellent condition. They were pulled from working systems. The HP part numbers are 726719-B21, 752369-081 and 774172-001. We will resolve the problem directly with you. M393B5673FH0-CH9Q5 2GB 2Rx8 PC3 -10600R HP parr number 500202-161. 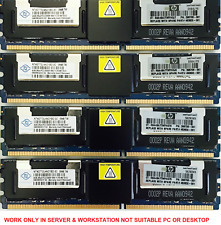 Taken from working production server tested ok.
8l1 x HP 16GB 2Rx4 PC3-14900R DDR3 ECC Server Memory 715274-001 712383-081. All tested and working. 8 more also available, message for details or deals. Dispatched with Royal Mail 1st Class. 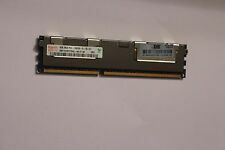 X2 HP DL160 G6 1U SERVER BLADE QUAD 2.0GHZ INTEL PENTIUM 3 2048 MB MEMORY. Error Correction: Fully Buffered ECC. Transfer Rate: 667Mhz. Capacity: 32GB (8x 4GB). HP ProLiant BL20P G4 Server Blades Dell Precision WorkStation R5400 IBM System x3450. HP ProLiant BL460c Server Blades Dell Precision WorkStation 490 IBM System x3500. We Also Record Serial Numbers. Fully Matched. Add to Favourites.